for the first time in what feels like months i’ve actually finished something! 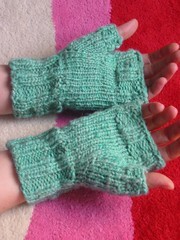 fingerless mitts made from this pattern from handspun merino/silk blend, dyed with food colours. a lovely easy knit, although i did have to rip back when i realised there was no way my holey m1s were ever going to be taken for a deliberate lace pattern as i’d hoped :lol: i was finding getting into the back of the loop almost impossible beause it was too tight. i finally managed it by going into the front of the loop and then sliding over the left needle while staying under the yarn (if that makes any sense at all). i’m much happier with the yarn than i was when it came out of the dyepot. it was lovely to work with and there’s just enough colour variation to be interesting but without being out-and-out variagated, which i’m not so keen on. the sheen of the silk really shows too. the rather unattractive bloom on the yarn which i took to be felting i now think was just patches of very fluffy merino. knitting has made those patches pack together and become denser, more colourful and less alarming.